Is the glass half full or half empty? In actual fact the glass is always full - its half full of air! Its just an example of choice - how we choose to see things in life and to experience them. We can choose either to attune to the darkness all around us or the light through it. When we see only the darkness and allow ourselves to become identified with that, here's when our internal trouble begins - although processing our inner attachments and releasing the pain is good, wallowing in it certainly doesn't help us move through. If we allow negativity to dominate our experience then internally we reproduce chemicals in the brain which flood our bloodstream, invade our bodily cells and create the feeling of internal stress - yes we're actually changing our very cell structure to become stress! In the centre of the village is a 'well-heeled' hotel, owned by the famous entrepreneur Richard Branson, which I knew had an amazing open air jacuzzi nestled into the mountain side. On this particular morning, I'd walked up to the village just before dawn and as I passed the hotel, I wondered if anyone would notice if I sneaked in and had a nifty dip in the jacuzzi. Surely Sir Richard wouldn't mind? So I did. Fortunately no one noticed me. And as I sank into the warming waters, I quickly began to feel joy and infinite peace as all tension dissolved away from my body. Around the pool were the soft colours of sandstone and as the sun came up over the mountains in front of me, the darkness of the sky began to lighten into a wonderful indigo and then golden orange. My favoured almond aroma wafted in on the gentle ocean breeze and in the trees all around me, the birds began their morning song, piercing the quietness with their fragile beauty. I was quickly losing any sense of separation; the healing effects of the water, the vibration of the birds song and the joy of the sun were becoming me and I was becoming them. All tightness quickly disappeared. As I reflect on it now, I'm looking upwards to the surface of the water and as the golden sunlight shines through, I can see my body becoming increasingly translucent, like a wafer thin film through which the water is gently rippling. It was at some point after that, it could have been an eternity because all sense of time had stopped, I felt what I can only describe as 'liquid gold' begin to flow downwards from the crown of my head and into my chakras. The sense of joy, love and upliftment was beyond words. Tears welled up in my eyes and flowed ceaselessly down my cheeks. Needless to say its a fond memory that will always remain in my awareness. And now, if I find myself surrounded too much by the darkness of the world and I need some respite, all I have to do is bring my attention to similar experiences and very quickly, warming, enlightening sensations begin to flood my system. They have a deeply uplifting, beneficial and healing effect. Exercise: exercising the body is a great way to healthy living and generating feel-good endorphins - like a fast walk or jog in nature. Deep Consciousness Bodywork: practices such as yoga, Tia Chi, moving meditation and Openhand's soulmotion are great at activating endorphins. Music & Dance: dancing to music is a great way to activate endorphins - explore Five Rhythms Dance for example. Also playing an instrument that you love and singing. Laughter and Lightness: create an atmosphere of laughter and lightness - perhaps take in a comedy film or the like. Aromatherapy: aromatherapy is great at activating endorphins. Try taking a hot bath with candles and natural oils. Soulfoods: healthy, tasty and stimulating food like raw chocolate is a great way to stimulate endorphins (go for varieties with no processed sugar). Massage: a good massage will generally release bottled up energy and activate those feel good endorphins. Loving sexual intimacy: being intimate with your partner (and yourself) is a wonderful way to divine union that activates endorphins in the process. Indeed there are many things in our daily lives that can generate such a positive endorphin effect. Exercise for example, deep breathing and making the choice to notice the simple beauty in life: the fragile innocence of a small child; the twinkle in an old lady's eye; an autumn leaf wafting on the breeze. If we keep applying ourselves in this way, even the seemingly insignificant can help generate uplifting joy. This is a form of meditation of course (who said it has to be about just sitting in silence?!). Thanks Open for the timely reminder. Finding the light through the darkness! What activates endorphins in you and uplifts your vibe? When you've been processing a lot of dense energy in your field - working through karma for instance - it's important not to get stuck in a negative spiral. And so I felt it timely today to draw attention to this article on endorphins once more, and particularly the 8 ways to generate them - to make you feel good and uplift your vibe. I am finding that expressing myself through guiding meditations, massaging myself or my children, preparing fresh foods with lots of fruits and vegetables bring me into such a transcendent state of being. Perhaps different than endorphins, but soothing and uplifting all the same! I also just love to get ridiculously silly with a friend or with my kids and just belly laugh until my smile hurts a bit =) exercising and working in the garden also activate endorphins for me. Thanks for a timely repost. Where do i draw the line between feeling, expressing, being one with the pain and finding light and positivity or generating endorphin as u said. Both Of these things seem to contridict in my mind,i trust my intution knows best but i felt to ask it anyway. Im on a holiday with my parents now. A situation here helped in bringing forward a pain of rejection which i could feel deeply in my chest. I have been feeling this tightness for some time now and its all out in the open. Ive been sitting in the beach feeling this asking 'show me' and my attention kept going to the waves reaching the shore. This somehow seemed to dissolve the tightness, expand and bring lightness inside. Now in trying to intellectually grasp the procees here(Do i have to?) I know the pain is deep seated and i have only touched the surface layer. Is an intellectual idea of process counterproductive because my intution seems to have entirely diff way. its a choice, in every given moment it's the perspective one has to either choose to be uplifted or not. This article is really good though and it reminds me that yes..You are what you eat. In which case I am a fruit with a side of nuts and almost everything else in between lol :) Either that or I am the swirly fruit loop in a bowl of regular fruit loops. But hey, least I'm still a fruit loop. It's that moment when the sun reaches that point in the sky that creates the most beautiful glow around everything, the dusk. Where all things are just gentle and soft and deliciously calm. It is also that moment when all things have just fallen down around you and you just wish with everything in you to lift everyone back up and all you can do is mentally create the hugest lightning storm you've ever seen. Because even in that, the lightning I identify with resonates deeply not just in myself but in everyone and everything. It is the yes, all is not well right now. But even a storm passes by eventually and then the most fulfilling moments can happen if one allows it to. Orrrr get on with that neuron replacement! Flip the switch of bad to good, it is possible.. All things are possible if one has a mind to make it that way! I am just thankful for humor and silliness most of all, without humor I probably would of fallen a long time ago and just stayed there going blech. Samwise and upping the endorphins! This week I took the lead in helping to shift a controlling and manipulative leadership energy to one of greater respect, kindness, harmony, and cooperation. With my encouragement and cheer-leading, other joined me, but when push came to shove, no-one wanted to take on specific responsibilities to up the energy. So my rays 1 and 4 kicked in big time as I tuned into the gifts of beingness of each participant and encouraged roles that matched those. Magically, all agreed so we're off and running. I was asked to be the big bopper in all of this but declined and supported another to take on that role, feeling that was best for me and all. I have taken on a lesser earthly role but it feels like a Guardian energy multi-dimensionally! I guess I continue to be more like Samwise Gamgee than Frodo! A good raw, vegan, sugar free chocolate does it for me everytime Cathy! As a fun-loving Pleiadian star-soul who appreciates the pleasures of endorphins, I second that, Aspasia! Well, I have been feeling to write about sacred sexuality for some time. I have to say, it does make me feel a touch exposed though! Then again, it's never stopped me before. Open, did you repost this article to remind yourself to write about sacred sexuality *kiss3* *KISSING*? For me, a day of freewheeling will lift my spirits. I try to do it once or twice a week whenever possible. Strong cup of coffee certainly gets my juices going on the trip. I like the freewheeling session to include both nature and modern city life. I also vote for #8 as the mother of all endorphins but haven't mastered it yet. Love your sense of humour Anatoly - ha ha! And such a great reminder to consciously practice freewheeling. I tend to be free wheeling with the freewheeling, if you like, so its random. I appreciate its a practice. Hi Everyone - I recognise there's been a fair degree of processing recently, especially around the Sirian Karmic Influence. That's why I felt to feature this article again today on activating endorphins in the body to restore harmony and balance. Remember, that when you've been processing a lot, it's important to not to get stuck in some whirlpool of negativity. Endorphins are chemicals in the body that block the uptake of negative energy. They 'balance the playing field' so to speak. Do scroll to the top and read the 8 ways in which you can activate them. Timely reminder as I got up early today to go to the gym ... Been feeling important to get moving first thing in the morning... Thank goodness for the gym as it was -0.5 C this morning in Florida!! I know a lot of people have been doing plenty of deep spiritual work through some pretty intense times. So I felt to remind everyone it's essential not to get sucked into an endless whirlpool of processing - take time out, take it easy, remember that really that reality is a kind of 'game', and it's the emergence of you, as you are, that really counts. So if you've been finding yourself processing heaps through a particular period, maybe it's time to stop for a while and interrupt the processing by activating endorphins through your favourite activities. As the lead article above discusses, endorphins are chemicals produced by the brain that prevent the uptake of negative neuropeptides in the cells. They make you feel light, expanded and happy. It's essential not to deny our processes, but balance is always essential - taking time out too. So do check into the article, read particularly the 8 ways to generate endorphins, and when it's appropriate, take some 'chill time'. And do share here - by giving energy to something, helps already stimulate and activate. Hi B - nice to "see" you - sounds great - synchronistically I'm building endorphins right now as we work to create the new Openhand documentary "PARADIGM SHIFT". You said it B. Ever so thankful for this reminder, Open. Just reading your reminder of what endorphins do for the body was enough to bring that wonderful feeling to the for-front. The light feels a little different today with tingles. Ps. 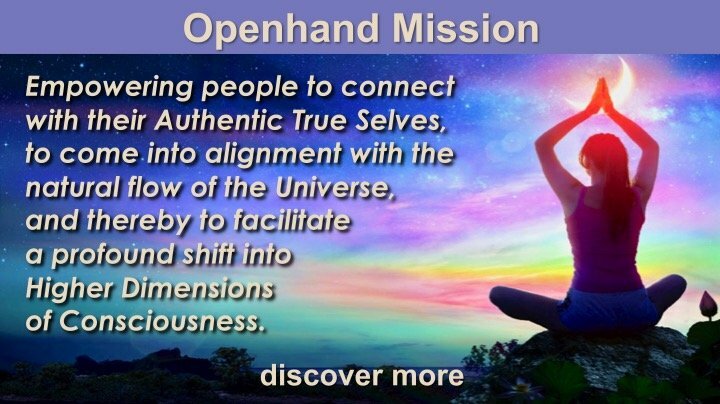 can't wait Open for the new Openhand documentary "PARADIGM SHIFT". that in itself gets the endorphins flowing. It's great to connect Open, Charlie and everyone. Coffee anyone? That seems to do it for me, not that I am attached it. A cup of a nice tasty coffee once in a while. Now every time i have a cup of coffee, I think of that Outlook bar in La Palma with its breathtaking views. Today I had a bit of a break from the 'lots of things to do' list (phew) and getting a ceremonial dose of endorphins! How so? Earlier, surrendering to someone else's creative vibe as they were doing my hair. I said to Elina: here is my hair see what you can create that is different. Felt very excited and adventurous. I am a LOT blonder than my 'habitual' style BUT I love the possibilities and the new relationship to pleasure in the new image. And later on, sitting in stillness, with incense burning (lovely aroma), meditation music, the fresh sight of trees and singing birds out of my window and a cup of sweet herbal tea. Feeling nourished. Wow - all these great endorphin sharings everyone - I get a buzz just reading them! Okay, so lets add some balance to our "life is a continual process" exploration. It needs to balanced by not taking life too seriously! That's the paradox isn't it? - if there is only the process, then why not accept it and dance with it? The important thing is not to wallow in the density. Yes, it's essential to work through what comes up, but remember, you're digging in the dirt to find those nuggets of soul gold - that what we're looking to integrate and express. That's why I felt to feature my article above on... "The Uplifting Effect of Endorhins and 8 Ways to Generate them (review how to uplift your day by scrolling to the top). Great convo. As a former addict and alcoholic, I spent a good 20 years chasing the highs including over exercising to get the runners high and other adreneline inducing activities because sitting still was boring! So it is quite the change for me to do nothing but I am embracing it. I'm OK doing nothing. Nothing is wrong with me in this space. I'm in a void it feels, nothing good nor bad just neutral. It's been going on for a while but I feel like if I try to pop myself out of it, that isn't what I'm supposed to be doing. I feel lightness, light exercise, light doing and letting things process on their own organically without my interference. Then sometimes I think maybe this is just part of aging and slowing down lol. Fascinating indeed!